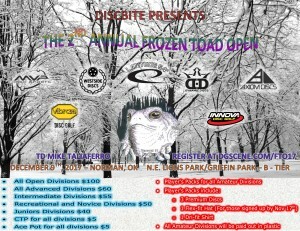 Welcome to The 2nd Annual Frozen Toad Open. Last year it truly was frozen, as it rained and misted pretty much the entire day. 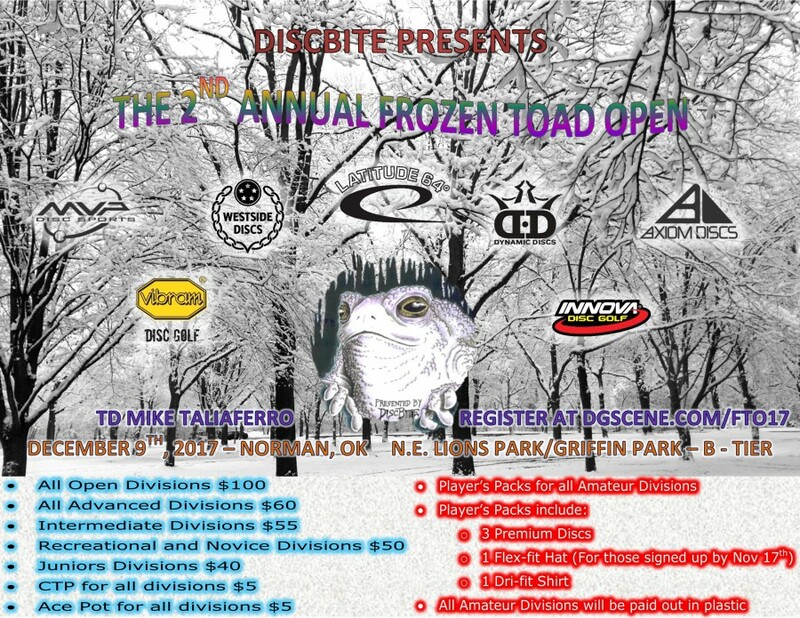 We had 50 tough as nails disc golfers out last year, and this year I hope to cap at 90 as well as make payout run a little smoother and quicker than it did last year. Players MUST email or phone their withdrawals to the Tournament Director only at the contact information posted for the tournament. Discussions with persons other than the Tournament Director, including other tournament staff, shall not be considered official. Players who have paid MORE than a nominal waitlist fee of $10 to be on an event's waitlist who do not get into the event, or officially request to withdraw from the waitlist prior to the events published closure of registration and waitlist replacements (1 week or less prior to the event is recommended), will receive a 100% cash refund minus the $10 waitlist fee. Waitlist players who ONLY paid a nominal non-refundable waitlist fee of $10 will not receive a refund. Players who officially request to withdraw from an event at 15 to 30 days from the start of the event will receive a 100% cash refund minus up to a $10 handling fee ONLY if their spot in the tournament is filled through either the waitlist or a walkup entry (if offered). If the player's spot is NOT filled, the TD has the choice to provide EITHER a 50% cash refund OR just the player's pack the player would have received if they had attended (minus the cost of shipping.) In the case of a player in a Pro division for an event without a Pro player pack worth at least 25% of the Entry Fee, the TD will provide the 50% cash refund. Players who officially request to withdraw from an event at 14 or less days from the start of the event and prior to the events published closure of registration and waitlist replacements (1 week or less prior to the event is recommended) will receive a 100% cash refund minus up to a $10 handling fee ONLY if their spot in the tournament is filled through either the waitlist or a walkup entry (if offered.) If the player's spot is NOT filled, the TD has the choice to provide EITHER a 25% cash refund OR just the player's pack they would have received if they had attended (minus the cost of shipping.) In the case of a player in a Pro division for an event without a Pro player pack worth at least 25% of the Entry Fee, the TD will provide the 25% cash refund.